Spring is upon us, with warmer weather, singing birds, and rabbit poop. There are many great things about spring, and one of those is the ability to do some more activities outdoors and elsewhere. 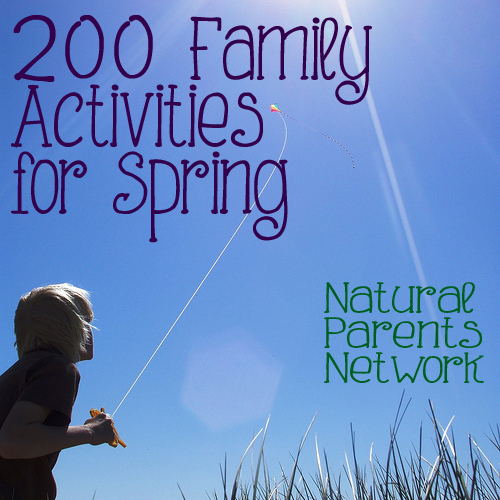 Check out our extensive list of fun things to do with your family this spring! 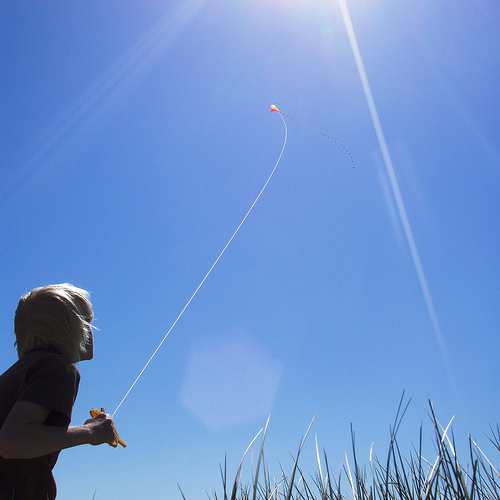 Fly a kite Spring is the perfect time to go fly a kite. 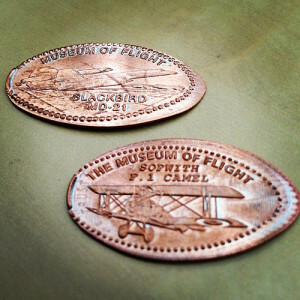 Make your own or purchase one and work together to get it flying up in the air. Launch rockets Building and launching rockets is a lot of fun for children and adults. Go barefoot With warmer weather, spend some time outdoors barefoot. Feel the new grass underfoot and play around. Adopt a tree Help out wildlife by adopting a tree. You can add a bird feeder or just leave some food out for the birds. Take family pictures The years pass by quickly. Take some family photos, and be certain to include yourself in them. Go to a cultural festival Celebrate a culture dear to you or learn about a new one at a cultural festival. Go skating Try your hand, or foot as the case may be, with some in-line skating. Go swimming Depending on where you live, it may be warm enough to swim outside. If not, head to an indoor pool for a chance to swim before the heat arrives. Make popsicles Homemade popsicles are a great way to make a healthy treat. Try making them with various fruits and vegetables. Pick your own produce Visit a pick-your-own fruit or vegetable place and pick your food as a family. Go to a farmer’s market Visit your local farmer’s market and get to know the people who grow your food while finding affordable healthy fruits and vegetables (maybe with a scavenger hunt!). Go stargazing Watch the stars. You may need to head out to the country to do this if there is too much light pollution where you live. Play hopscotch You can play hopscotch just about whever you are. Play ball Get outside with your kids and play ball with them. Have a movie night Stay home and have a movie night with a family favorite. Have family game night Introduce family game night to your family. Bored with typical board games? Check out serious board games for an entirely new, and incredibly fun, family experience. Practice random acts of kindness Spend a day, or spread it out, practicing random acts of kindness. The kindness keeps on going. Create a fairy garden or secret garden Create a fairy garden complete with a little fairy house or a secret garden known just to your family. Deliver handmade goodies or flowers to the neighbors Take a treat to the neighbors, and make their day a little brighter. Adopt an honorary grandparent Adopt an older person to have as an honorary grandparent. You will be enriching each other’s lives. Make play dough Homemade play dough is smoother and more economical than its commercial cousin. Enhance the experience by adding essential oils or Kool-Aid for a scent-sationally good time. Go camping. You don’t have to go far away to go camping with your family. If you have a backyard, you already have a perfectly free campground at your disposal (and one with indoor facilities located a mere walk away). 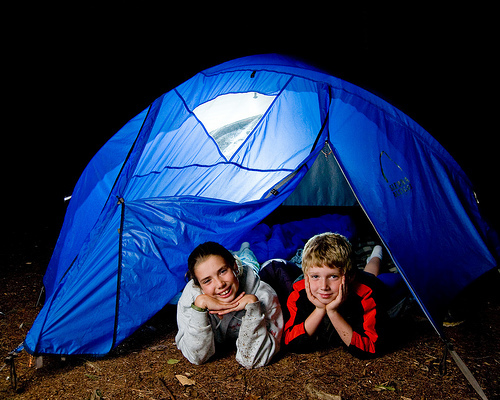 If you are up for some more adventure, check out local campgrounds or plan a longer camping trip. Go letterboxing. Letterboxing has been around for a long time, but many families still haven’t discovered the fun. It’s like a family friendly treasure hunt. Follow the clues found at Atlas Quest and then log a stamp in your letterboxing book and your stamp in the box’s log book. Sidewalk chalk masterpieces. Gather your family, or multiple families, and work together to make some huge sidewalk art. Nature hiking. With the warmer weather, it is the perfect time to go on a nature hike. Short or long, hiking is a naturally healthy way to have some fun. Walk around the neighborhood. Stay in your own neighborhood while taking a walk together. Look for signs of spring and perhaps visit with neighbors while you exercise. Go for a bike ride Biking as a family can be a great way to exercise and travel. It is also Earth-friendly. Plant flowers Spruce up your yard or a pot in your home by planting some flowers. Plan and plant a garden Having children help in the planning and growing of fruits and vegetables gives them a vested interest. They will learn about their food and taking care of plants, be a contributing member of the family, and have a great time with you. Plant a children’s garden Consider planting a children’s garden just for the kids. Consider things such as sunflower houses or just a place for your children to dig and grow whatever they want. Visit museums There are so many museums from which to choose. Share a bit of history as a family. Go to the park Go play at a favorite park or one new to you. Don’t forget to actually play and have fun with your child. Have a picnic Eating outside is more fun. Pack a picnic lunch or dinner (or breakfast or snack) and head outdoors. Make mud pies Those squishy little pretend pies are a great source of dirty fun. Build a campfire and make s’mores Fires are more fun as a family, with safety in place. Enjoy some sticky s’mores while you tell tales around the campfire. Try geocaching Another type of treasure hunt, geocaching is similar to letterboxing but requires a GPS system. Write a letter to someone Write an actual letter to someone and send it through the post. Make bird feeders Make a feeder for your feathered friends, and watch as the birds come visit. Make a bat house Build a bat house together. Hopefully the bats will find it and move in prior to mosquito season! 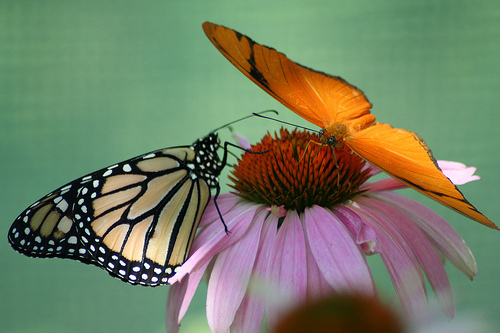 Create a butterfly garden Encourage butterflies to come to your home by planting species of plants that will attract them. Play in the sprinklers It may be a bit chilly to swim outside, but chances are your children will be up to playing in the sprinklers. Dare yourself to jump in, too. Visit a nature center Check out the natural world at one of your local nature centers. Go to the zoo Zoos have improved greatly over the years. Go check out some animals at your local zoo, and see what you can do to help the animals. Make nature wands Nature is magical, so why not combine nature and magic with some nature wands? Start a nature journal Start a family nature journal to chronicle your adventures. Encourage your children to help you write about your experiences or draw pictures of what you see. Bird watch Learn about birds, and watch to see what species come to your neighborhood or backyard. Climb trees Climb trees with your children. See what you can see from your new perch. Read a chapter book outside Move your reading outside to enjoy the nice weather. Make garden stones Mark the plants in your garden or just add some fun characters with some hand-painted garden stones. Do science experiments outside Enjoy messy science experiments outside rather than making the mess inside. Make a worm bin Make a worm bin and learn about the joys of vermicomposting. Dance in the rain Head outside and dance with your kids as though no one is watching. Catch fireflies Catch fireflies with your children and capture the joy of being a kid. Go to the library Head to your local library for some spring-themed books. Scavenger hunt Go on some type of scavenger hunt to see what you can find. Play with pool noodles Pool noodles aren’t just for the pool. Whether made into light sabers or hurdles, pool noodles make durable outdoor toys. Visit a pond Learn about nature as you visit a nearby pond. See what is lurking in the water and demystify pond ecosystems. Become bug explorers Go on a bug hunt with some magnifying glasses and a bug indentification book. Learn about these unique little creatures. Make suncatchers Celebrate the return of the sun with some artsy suncatchers. Play frisbee golf Play disc golf as a family. Capture your shadows Capture your shadows any way you like. Perhaps you prefer to take pictures, or maybe you just want to use sidewalk chalk to trace them. Play with sticks Is there anything better than sticks when it comes to playing outside? How many things can you do with them? Write a story together Write a story with your children and illustrate it (or not). Have a hot dog roast Cook dinner outside over a fire or grill. Make jam Use some of the produce from the farmer’s market to make some delicious jam. Watch clouds Take a break and watch the clouds go by. See what shapes you can see. Go to a parade Go to a parade and cheer at the entries. Blow bubbles Blow bubbles and experiment making them different ways. Go to a sports game Take your kids to watch a game in person. Watch the sunrise Get up early and watch the sunrise together. Watch the sunset Stay up late and watch the sunset together. Camp in your living room Camp out in your living room. Stay up until midnight Challenge everyone to stay up until midnight and have a special surprise or treat. Make tie-dye shirts Make colorful shirts for everyone in the family. Make homemade ice cream Make your own ice cream that is free of preservatives or excess sugar. Give to charity Find a way to give to a charity of your choice. Spring cleaning Clean up the house together with spring cleaning. Build a sand castle Build a giant sand castle together. Add moats or dragons. Go fishing Go fishing and either cook the fish for dinner or release them back to the water. Hatch butterflies Hatch butterfly eggs and watch as the caterpillars grow and transform into beautiful butterflies. Run a race Run a race for a cause or for fun. Go to an arboretum or botanical garden check out the beauty to be found at local arboretums or botanical gardens. Go someplace you have never been before Go some place you haven’t been before just to try something new. Collect smashed pennies Collect smashed pennies on your travels. Smashed pennies are inexpensive souvenirs. Eat something new Try a new food. Go on a factory tour Call a local factory or business and arrange to go learn about how something is made. Build a fort or tree house Build a playhouse in your backyard for years of fun. Host a tea party Invite over friends for a fancy spring-themed tea party. Feed the ducks Take some old bread and feed ducks at a duck pond. Make pinwheels Make pinwheels and see how long you can keep them going. Go horseback riding Try horseback riding with your family. Go boating Whether on a large boat or canoe, try out boating. Make and disperse seed balls Make seed balls using old paper, water, and seeds. Disperse them in nature. Go bowling Look for parent and child sessions for an affordable game of bowling. Paint pottery Paint your own pottery for pieces you will use everyday. Make spring-themed cut-out cookies and decorate them Cutting out cookies and decorating them is fun for everyone. Have everyone help clean up together. Make a family handprint collage Make a handprint collage using your family’s hands. Volunteer as a family Find an opportunity where yor family can volunteer together. Declutter your home Get rid of your clutter and sell or donate it to someone who can use the items. Start a compost bin Start a compost bin in your backyard. Install rain barrels Make some rain barrels to collect rain for your gardens. Start a rain garden Start a rain garden and watch it bloom. Make adventure bags Make adventure bags with whatever you might need. Some suggestions include: magnifying glass, flashlight, tape measure, rope-tying kits, first aid kits, etc. Attend an outdoor concert Listen to a family-friendly performance outdoors. Go to a children’s museum Visit a local kid-focused museum. Take everyday pictures of your family Take picture of everyday life rather than just posed photos. Visit a local farm Visit a farm and learn about the animals. Have a pretend power outage Pretend you lost electricity and unplug for a while. Grow your own chia people Make your own chia pets out of recycled materials and grass seed. Make emergency plans Go over your emergency plans, and make certain you have all of the supplies you need. Make a pie Making pies is messy and is a perfect activity for kids. Play miniature golf Show off your golfing skills at mini golf. Go to an art museum Introduce your children to the art museum and instill a life-long love of art. Press flowers Use books to press flowers. 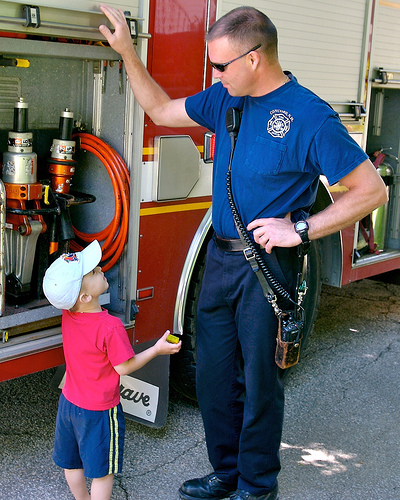 Tour a fire station Take a tour of your local fire station so your kids know what to expect should they ever be in a fire. Tour the post office Learn about how mail makes it from your house to somewhere else at the post office. Learn about a different country or culture Pick a different culture or country, and check out maps, books, and online resources. Swing Don’t forget to pump your legs. Make your own pizzas Make your own pizza for a fun, healthy, and affordable treat. Host a party Invite friends and neighbors over for a party. Play card games Pull out a deck of cards and play some old-fashioned card games. Put together a scrapbook Put together a photo book or scrapbook about your family adventures. Put together a puzzle Pull out a jigsaw puzzle and work together as a family. Pick wildflowers Go searching for wildflowers. Make sun art Make some art to recognize the upcoming summer. Check out UV-sensitive paper or beads. Make lemonade Make homemade lemonade. Mail a package. Put together a paackage for someone special and mail it. Open the windows. Let in the fresh air. Color eggs Use commercial colors or read about how to dye eggs naturally. Make homemade marshmallows An easy creation, make homemade marshmallows without the high fructose corn syrup. Clean out the garage Take advantage of spring to clean out the garage. Go to a drive-in movie Go to a drive-in movie or make your own with boxes in your living room or a projector outside. Get crafty Have a craft day and catch up some some of those craft projects you have been putting off. Try a new recipe Try out a new recipe and find something new for your meal rotations. Make a rain gauge Make a rain gauge to chart how much rain you are getting. 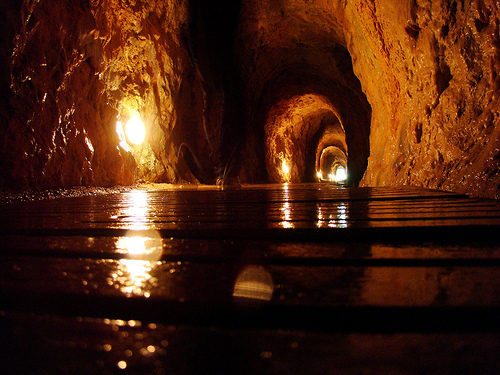 Visit a cave Visit a cave and learn about the animals that live in them. Go puddle jumping Jump in muddles and concentrate on how much fun it is. Make paper airplanes Make paper airplanes and see what designs fly the farthest. Family tree project Work together to put together a family tree and learn about your ancestors. Go rock climbing Climb rocks at a level appropriate for your family members. Participate in a family-friendly flash mob Find a kid-friendly flash mob and join the fun. Make your own bug spray Prepare for insects by making your own natural bug spray. Watch a meteor shower Check out one of the meteor showers for an all-natural nighttime show. Take a nap outside Take a nap outside, or at least chill out a bit. Become a tourist where you live Pretend you are a tourist and check out some of the attractions where you live. Make a nesting ball. Add scrap pieces of yarn and thread to a grapevine ball to make a nesting ball for birds. Update your will. It may not be a family activity, but it’s something we should do as parents to protect our children. Walk instead of drive. When possible, walk to places rather than driving. It’s healthier for you and the environment. 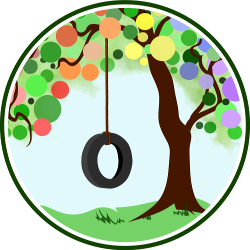 Field day Invite other families over for an old-fashioned field day, complete with tug of war, spoon races, and more. Potluck dinner Gather friends and family for a shared meal. Don’t check messages Whether for a weekend or an entire week, take some time off from checking messages, phone, e-mail, text, whatever, and focus on your family. You’ll probably reminisce to your kids about when you were a kid. Pack away the winter clothes Get those extra clothes out of the way, and out of the laundry, by packing away the winter clothes. 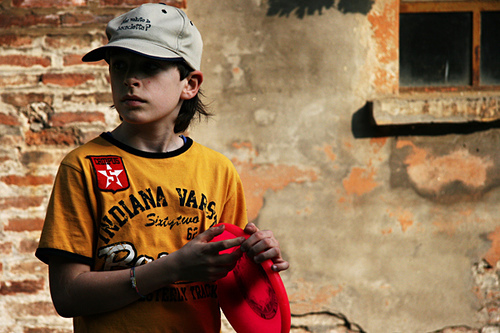 Go on a dig Go on an archeaological dig to help find precious artifacts. Visit a historical site Visit a historical site and learn about the area you’re living in or visiting. Living history museums More than a museum, living history museums bring history to life with live actors. It’s a museum. It’s a play. It’s a lot of family fun. 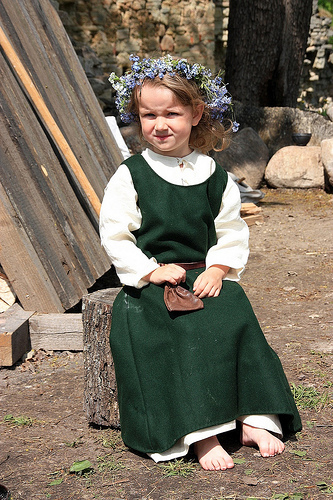 Make daisy crowns Or clover crowns. You know you want to. Be royalty for a day. Give everyone a day Don’t just celebrate loved ones on their birthdays. Give each person a chance to plan a day, whether it’s what is for dinner or where you are going. Backyard games Check out some backyard fun with games such as bocce ball, croquet, or lawn darts. Tree identification Learn how to tell trees apart and about which trees have different types of blooms in spring. Buy a new plant Bring home a new plant for your house. Plants are natural air filters and help to purify the air in your home. Grow seedlings inside Watch seeds sprout and grow in your kitchen. Start an herb garden Start your own herb garden outdoors or inside in pots for kitchen use. Dye plants Use food coloring and water to dye carnations or celery. Start your own holiday Start a brand new holiday just for your family, complete with a new tradition. Make your own letterboxes If you enjoy letterboxing, try making your own letterboxes and hiding them for other families. Leave goodies for someone While we don’t normally advocate ringing someone’s doorbell and running, you can always try leaving flowers or a treat before you take off or just quietly leave something on the person’s front porch. Visit a nursing home Make plans to visit a nursing home and pass out homemade treats and handmade art to the residents. Spend some time visiting with individuals who may not receive frequent visitors. Sing karaoke. You don’t have to have a karaoke machine to belt out some tunes. Have a family karaoke night just by turning on the stereo. Dance Put on your fancy clothes and go dancing, even if it’s in the kitchen. Have a formal dinner Make a nice dinner and go formal. You might want to mention proper etiquette for anyone unfamiliar with it. Talk in an accent Try out a different accent and see if you can use that for the entire day, or at least through dinner. Family-friendly dates Come up with some dates you can have with kids in tow. Make pretzels Make homemade pretzels in spring-themed shapes. Favorite foods dinner Make dinner using only your family’s favorite foods. Wear costumes out Dress up in costumes and go out on the town in your silly attire. Get out of town You don’t have to go far, stay long, or spend much to have a fun time away. Plan a day trip with your children and get out of town. Make stepping stones Make stepping stones for your garden. 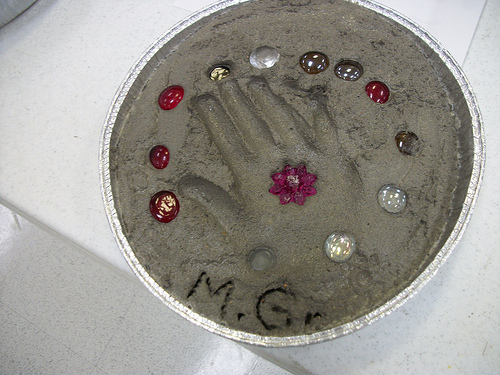 use your children’s hand or footprints as a wonderful keepsake and have small items on hand that they can embed in the stepping stone. Capture the flag Put your heads together as you play a giant game of capture the flag with friends and family. Enjoy a thunderstorm Is it the rainy season where you live? Take advantage of a thunderstorm to spend some quality time together, enjoying the beauty of the storm. Maple syrup See how maple syrup is made and use some on your breakfast. Have a garage sale or swap Make some money off your unwanted items with a garage sale, or have a swap with friends. Take any unwanted items to charity. Make sun jars Use an inexpensive solar light to make a sun jar. Recharge it outside during the day and bring it in for a low glow to use as you tell stories at bedtime. Fossil find Go on a fossil find to check out what fossils lie around where you live. Clean out the car Clean out the car after a long winter. Bag any trash, take in forgotten items, and vacuum or wash it. Have a fashion show Try on all of those clothes to see if they still fit with a family fashion show. Pack away, sell, or donate any that are too small or need to be retired. Make crafts from your child’s artwork With children come masterpieces. Use them as inspiration to make some household crafts around your house, honoring their creativity while gathering the best pieces of work into items you will use daily. Interview your children Interview your children and make a photo book just about them. Use artwork, catchphrases they say, great photos, and answers to whatever questions you, or they, ask. Pull taffy Make old-fashioned homemade pulled taffy. Be certain to have enough adults to finish pulling the taffy. It’s a monumental task. Tracking Look for animal tracks and make some molds. See if you can follow directions with a compass and track your way home. Backyard wildlife sanctuary Learn about how to make your backyard, or at lest a section of it, into a wildlife animal sanctuary. Work together as a family to create a wildlife area for animals, and you, to enjoy. Home makeover Give your home a mini-makeover this spring by painting or changing something that needs it. Get organized Decluttering and spring cleaning are a great way to make a home more manageable, but while you have everyone working together, get everything organized. Hot air balloons Go to a hot air balloon show. 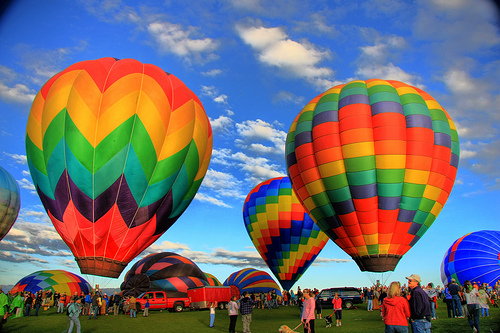 Bright and colorful, hot air balloons appeal to adults just as much as to children. Make silhouette pictures Make old-fashioned silhouette pictures using newer technology. Take a profile picture with your camera and turn it into a silhouette. Make extras to mark off some gifts for extended family. Make a tree book Gather new leaves and flowers to start a tree book. You can add onto it in the fall when the leaves turn colors. Go to bed early. We tend to forget that we need to sleep as we exit the dreary winter days. Don’t forget to get some extra sleep by turning in early occasionally. This is a great list, thank you for sharing!! I hadn’t heard of letterboxing before, thanks! Yay, MANDY! Now we have no excuses. None. 🙂 Thank you for this lovely list. So awesome! Pinning and sharing!